The Irrawaddy dolphin exists in small isolated populations around Southeast Asia. Some populations are close to extinction such as the those in the Mekong River and Malampaya Sound in the Philippines. The main threats are from fisheries bycatch and habitat loss. The species is primarily found in Southeast Asian estuaries and mangrove areas, with freshwater populations occurring in river systems. The Mahakam river population of Irrawaddy dolphins, found in the Kalimantan province of Indonesian Borneo, is severely threatened by fisheries bycatch and habitat degradation, and may number as few as 34 animals. Surveys conducted in 2001 estimated that the Malampaya Sound population in the Philippines consists of just 77 individuals, confined to a small area in the inner sound, and is the only known population of this species in the country. During 2001 there were reports that as many as five animals from this population were killed incidentally in fishing operations, indicating that the Irrawaddy dolphins of Malampaya Sound are in immediate danger of extinction due to low numbers, limited range, and high mortality. The Mekong River Irrawaddy dolphin (Orcaella brevirostris) population inhabits a 190km stretch of the Mekong River between Cambodia and Lao PDR. The latest population is estimated between 78 and 91. The Irrawaddy dolphin is identified by a bulging forehead, a short beak, and 12-19 teeth on each side of each jaw. The pectoral fin is broadly triangular. There is a small dorsal fin, on the posterior end of the back. When diving, this dolphin breathes at intervals of 70-150 seconds; the head appears first and then disappears, and then the back emerges, but the tail is rarely seen. Head and body length is 180-275 cm. Irrawaddy dophins are slaty blue to slaty gray throughout, with the underparts slightly paler. Cetaceans (whales, dolphins, and porpoises) are a priority species. WWF treats priority species as one of the most ecologically, economically and/or culturally important species on our planet. And so we are working to ensure such species can live and thrive in their natural habitats. Irrawaddy dolphins are distributed in shallow, near-shore tropical and subtropical marine waters. They are primarily found in estuaries and semi-enclosed water bodies such as bays and sounds, usually close to mangrove forests. Freshwater populations occur in river systems. There are no more than 10 animals to a group usually, and solitary individuals are rarely seen. The species eats fish and crustaceans. 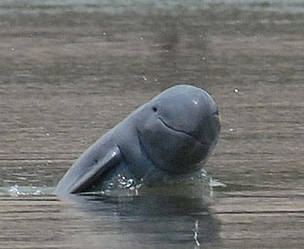 Irrawaddy Dolphin from WWF on Vimeo. Freshwater subpopulations occur in the river Mahakam of Kalimantan (Indonesian Borneo), the Ayeyarwady (formerly Irrawaddy) of Myanmar (formerly Burma), and the Mekong Delta of Laos, Cambodia, and Vietnam. They are also reported in isolated brackish (saltwater and freshwater) water bodies, such as Chilka Lake in India and Songkhla Lake in Thailand. There have been serious population declines in parts of Thailand, and in the Mahakam river (Indonesian Borneo) freshwater sub-populations. The latter was classified as Critically Endangered in the IUCN Red List in 2000 after surveys found only a few tens of dolphins in approximately 300 km segment of a river. In the Philippines, the few Irrawaddy dolphins of Malampaya Sound (Palawan) appear to be geographically isolated from other sub-populations, which could earn that population the status of Critically Endangered. There, the dolphin population is in immediate danger of extirpation due to low numbers, limited range and high mortality. A 2001 survey put their population at 77 individuals over a 133 km² area. What are the main threats to the Irrawaddy dolphin? Although the Irrawaddy dolphin is not directly exploited, it is exposed to incidental mortality in fisheries (e.g., gillnets in Australia and in Malampaya, explosives), the principal cause of depletion. Habitat degradation due to development of dams, deforestation and mining also continue to undermine the species to a lesser extent. 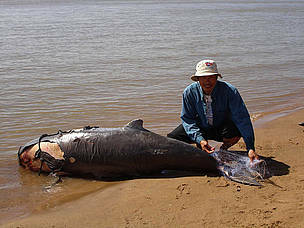 Mekong River Irrawaddy dolphin (Orcaella brevirostris) found dead in Cambodia. WWF works with the Cambodian government's Department of Fisheries to implement the Cambodian Mekong Dolphin Conservation Strategy. WWF is also helping Cambodia and Lao PDR to coordinate their conservation efforts. Key elements of the work include raising public awareness, development of relevant laws, responsible tourism, and Irrawaddy dolphin research. WWF initiated the Malampaya Sound Research and Conservation Project in the Philippines in December 2001 to sustainably manage the fisheries of Malampaya Sound and to effectively manage and protect the Irrawaddy dolphin population in the area. Malampaya Sound, to date, is the only known habitat of the Irrawaddy dolphin in the country. In 2004, WWF and TRAFFIC supported a ban on the international live trade of Irrawaddy dolphins for oceanaria by the Convention on International Trade in Endangered Species of Wild Fauna and Flora (CITES). Conserving Endangered Dolphins in the Inner Gulf of Thailand. 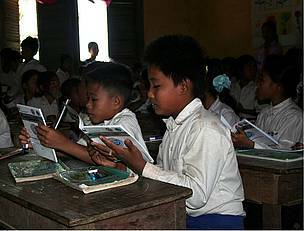 Cambodian students learned about Irrawaddy dolphin conservation in the Mekong. Reports from the 1970s show that the fishermen of Burma attract the Irrawaddy dolphin by tapping the sides of their boats with oars. By swimming around the boat, the dolphin brings the fish into nets, and the fishermen share their catch with it.